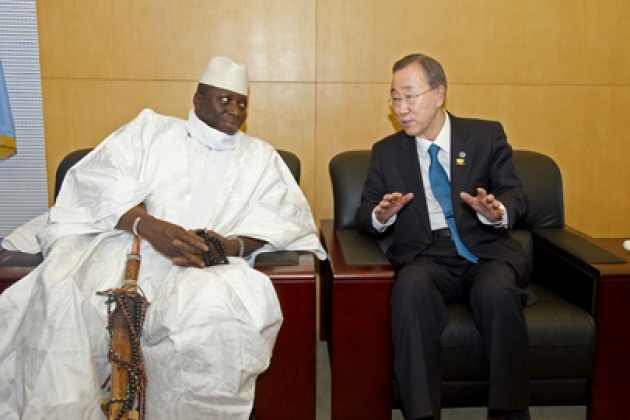 UNSG Ban Ki-moon should refuse to meet Gambia’s strongman Yahya Jammeh unless/until such heeds the plea of UN officials to halt the executions. Not only do the executions represent a dramatic setback for efforts to curb the death penalty, a UN objective, but from the evidence and descriptions provided regarding rule of law and transparency, such may constitute grave violations of international humanitarian standards/law. Those responsible for such violations should not be coddled, and conveying to them that such behavior will only backfire if they employ death penalty as camouflage for their own sins. Correctly, the UN has already adopted standards consistent with our advice when relevant with respect to UN mediators/representative dealing with human rights violators. See our Report & UN Linked Guidelines for Mediators. UN cannot block Jammeh from attending/speaking, but it can deprive him of legitimization by being received by the UNSG and other officials, unless the purpose is to halt the executions. What is “Motivation” Behind Executions? “The confusion and lack of transparency for several days over whether the executions actually took place, and accompanying uncertainty about the identity of those executed, is unacceptable, particularly for the family members of those killed. Secretly executing individuals without informing their families amounts to inhuman treatment,” asserts UN High Commissioner for Human Rights Navi Pillay. “The statement by President Yahya Jammeh that all remaining death sentences would be carried out by mid-September is extremely worrying, and raises serious questions about the motivation behind the sudden rush to execute. A further statement by the Ministry of the Interior, which seeks to justify the change of policy, is seriously misguided.” HC Pillay demanded for The Gambia to immediately cease the executions and apply a moratorium to the death penalty. HC Pillay has added her voice to a unified NGO family, including Amnesty International. She directly adds her voice to that of UN Special Rapporteur on extrajudicial, summary or arbitrary executions, Christof Heyns :“I am concerned that death sentences were imposed in violation of major international standards, including the most serious crimes provisions. According to available evidence the trials did not meet due process safeguards. The executions were carried out in secrecy, away from the public and from the families, and do not meet the requirements of transparency,” The 9 were apparently executed by firing squad, and Mr. Heyns called on Gambia's Government to refrain from executing an additional 39 people reported to be on death row. 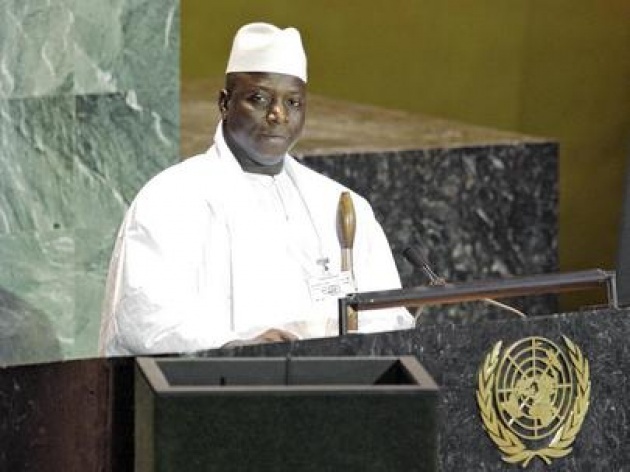 “I strongly condemn the executions that took place last week in The Gambia, and call for a halt to further executions. This stream of executions is a major step backwards for the country, and for the protection of the right to life in the world as a whole. These executions undermine previous steps towards the abolition of capital punishment in the Gambia,” stressed the human rights expert, recalling that the country was at the forefront in the region’s efforts to abolish in law and practice the death penalty, with a moratorium on the death penalty for 27 years and the abolition of capital punishment for drug offences in April 2011. Mr. Heyns noted that the country was at the forefront in the region’s efforts to abolish the death penalty in law and practice, with a moratorium on the death penalty for 27 years and the abolition of capital punishment for drug offenses in April 2011. Prior to theses 9 executions carried out on 26 August, the last official execution in the West African nation took place in 1985 prior to when the current leader/junta of President Yahya took over in a military coup, according to a news release issued by the Office of the UN High Commissioner for Human Rights (OHCHR). we have already expressed our dismay at the actions of this Government which may be sacrificing these condemned prisoners to camouflage its own sins of corruption and ineptitude. Read our Blog for Film: "Death Penalty as National Holiday".